Figure 6.5 Flow-chart showing the classification methods used to create the landsystem maps (see Fig. 6.6). Input layers on the left were classified into the seven landsystems shown on the right. The order and type of classification are shown in the middle. The numbers show the order in which the classification was carried out. 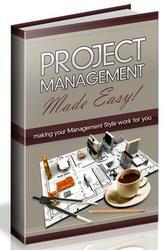 Classification was done by using a series of structured-query-language commands on the database tables. 4. bedrock-dominated glacial landscapes (landsystem D). Glacifluvial (landsystem E) and glacilacustrine features (landsystem F) dominate two additional landsystems. Landsystems D and G were primarily created before the LGM, although there has clearly been continuing evolution of the landscape up to the present. Figure 6.6 Landsystem maps of the area covered by the southern margin of the Laurentide Ice Sheet. Each cell (7.5' x 7.5') corresponds to a classification set shown in Fig. 6.5. Dark line shows the extent of Late Wisconsin glacial maximum. Light grey line shows the maximum extent of Pleistocene glaciation. 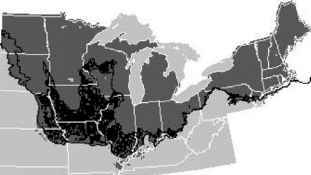 Landsystem A occurs extensively in Ohio, Indiana, Illinois, Michigan, Minnesota, Iowa, North and South Dakota. It formed when ice was at or near its maximum southern extent and during retreat (Fig. 6.6A). We divide landsystem A into two zones: ice-marginal and subglacial (Figs 6.7 and 6.8). We interpret that landsystem A primarily reflects subglacial sediment transport and subsequent deposition as basal till. This zone is composed of a ramp of diamicton inclined up-glacier. Steeply sloping fans composed of outwash and debris flow sediment occur along the outer edge of this zone. Proglacial outwash deposits merge into valley train deposits. Along the outermost margin of the ramp, older glacial and non-glacial deposits are deeply dissected by stream erosion. Fine-grained sorted sediment is present in major stream valleys. Figure 6.7 Schematic diagram showing the distribution of landforms and sediments in landsystem A. The marginal zone consists of a broad, low-relief end moraine composed primarily of basal till over older glacial drift with a cover of supraglacial sediment. The subglacial zone consists of till plain also composed of basal till with few features except for rare flutes. In the subglacial zone supraglacial sediment may be completely absent. Glacifluvial (landsystem E) and glacilacustrine (landsystem F) landforms and sediments fronted this landsystem in the proglacial area or were superimposed on this landsystem during deglaciation. Bedrock in this area only rarely crops out, and glacial deposits are generally greater than 15 m thick. During retreat, ice-marginal zones of landsystem A were superimposed on older landsystems as is shown on the right of the diagram. In the southern Great Lakes region in Illinois, Indiana, and Ohio each readvance deposited a wedge-shaped sheet of basal till on top of older sequences during retreat. Figure 6.8 The location of aerial photographs and images cited in the text. End moraines in landsystem A are 2—20 km wide, with asymmetric cross sections (Figs 6.9 and 6.10). The distal sides of the moraines have 1—2 per cent slopes, whereas the proximal slopes are less than 1 per cent (Hansel and Johnson, 1999). The moraine surface is smooth, except for postglacial gullies cut into surfaces (Fig. 6.9). Low-relief hummocks and closed depressions are rare and the internal moraine relief is generally less than 3 m. Moraines are mostly composed of homogeneous diamicton interpreted to be basal till capped with a thin layer (<2 m) of heterogeneous diamicton that may be supraglacial sediment. Although some of the material in the moraines is local, it has been suggested that most of the sediment originated a considerable distance up-ice and was transported into the area with little modification except clast abrasion (Hansel and Johnson, 1999). Many of the moraines have far-travelled erratic boulders concentrated at or near the surface. Behind the end moraine lies a flat or gently undulating till plain (Figs 6.7 and 6.9). The plain has few distinct landforms and generally a local relief less than 3 m. Rarely, a few low-relief flutes are present (Hansel and Johnson, 1999). Much of the diamicton is basal till, although locally there is a thin veneer of supraglacial sediment and a loess cap. Stacked sequences of late Wisconsin diamicton and sorted sediments make up both moraines and till plains (Johnson and Hansel, 1990; Hansel and Johnson, 1996, 1999). Many of the moraines are composite forms and were modified during more than one advance or period of stability during the late Wisconsin. Palaeosols have been preserved between diamicton sheets. Diamicton units are wedge shaped, with their thickest end in the moraine zone and thinning to a wedge under the till plain. Sub-diamicton contacts are generally clear and show little thrusting or folding-in of older sediment. In some places, sub-bed material has been incorporated into the overlying diamicton. At a few sites, clast concentrations and clast pavements have been reported, but these appear to be neither continuous nor widespread. Figure 6.9 A shaded-relief image derived from a 30 m US Geological Survey DEM of the southern part of Lake Michigan lobe area. Moraine names are from Hansel and Johnson (1996). 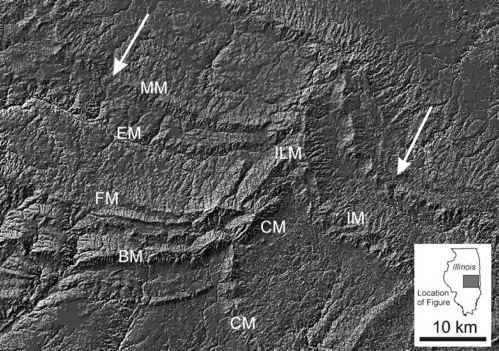 MM = Minonk moraine, EM = El Paso moraine, FM= Fletchers moraine, BM = Bloomington moraine, CM = Champaign moraine, IM = Illiana moraine, ILM = area of interlobate moraine. Each end moraine has a steep distal margin and a ramp-like proximal margin. Note that much of the surface roughness is the result of postglacial fluvial erosion as gullies and streams. Both the marginal and subglacial zone have very little original roughness or internal relief. 4. active ice with progressive retreat of the terminus. There appears to have been very little, and perhaps no subglacial erosion of pre-existing sediments in the marginal areas. Widespread paleosols, present on older units, indicate limited erosion. Certainly, abrasion was taking place, and striated surfaces, rare clast-pavements and striated boulders are present throughout the area. The wedge-shaped till sheets suggest erosion by later advances but probably only at their up-ice ends. Unlike landsystem B, drumlins are absent. With the exception of a few low-relief flutes, there appear to be no streamlined features. Tunnel channels, a common feature in landsystems B and C, are also absent. Likewise, ice-thrust masses and composite ridges, a common feature of landsystem C, and to a lesser extent landsystem B, are also absent. Eskers are nearly absent. The distribution of outwash along the former ice margins suggests that water was delivered to the ice margin in small subglacial or englacial tunnels as opposed to being concentrated in large discharge events or esker tunnels as in landsystems B and C.
Permafrost may have been present in Illinois, Indiana and Ohio (Johnson, 1990), but it was probably thinner than that in areas farther north. Wood preserved in tills in Illinois, Indiana and Ohio suggests that the Lake Michigan, Saginaw, Huron and Erie lobes advanced into areas with trees so it is likely that permafrost was discontinuous (Mickelson et al., 1983; Ekberg et al., 1993; Hansel and Johnson, 1999). We support the conclusions of others that till in this landsystem was transported and deposited at the base of the ice, perhaps as a deforming bed (Boulton and Jones, 1979; Beget, 1986; Alley, 1991a; Clark, 1992; Hansel and Johnson, 1999). Ice motion was probably accommodated by a combination of sliding, ploughing and subglacial deformation. What is not clear is whether transport prior to deposition was as a subglacial deforming bed of dimensions metres-thick, or as melt-out of debris-rich ice in slabs detached near the terminus. 4. initial advance over an unfrozen subglacial bed followed by progressively retreating active ice during deglaciation. 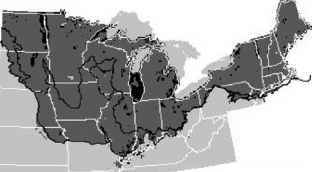 Landsystem B is located in North Dakota, Minnesota, Wisconsin, northern Michigan, Pennsylvania, New York, New England and as a small window in southern Michigan (Fig. 6.6A). It is dominated by drumlins, sandy diamicton and high-relief, hummocky end moraines. We interpret that this landsystem reflects subglacial erosion and supraglacial deposition near an active ice margin. This zone is a landscape that has always been mapped as end moraine (Figs 6.11 and 6.12). The zone is 2—20 km wide and consists of moderate- to high-relief hummocks in end moraines. The end moraine stands 5—40 m above the surrounding landscape (Fig. 6.10B). Distal and proximal slopes of the end moraine exceed 2 per cent. The internal relief of hummocks is much higher than in the smooth moraines of landsystem A. In most places the moraines are narrower (<2 km), but are about the same height as moraines in landsystem A. Within wider hummocky end moraines are large flat plateaux of sorted sediments and glacilacustrine sediment that have been interpreted as ice-walled lake plains (Johnson et al., 1995; Ham and Attig, 1996). Ice-walled lake plains are found in Minnesota, North Dakota, Wisconsin, Michigan and in southern New England (as the 'high kames' of Stone and Peper, 1982). Moraine composition is different from that in landsystem A. There is a much larger component of glacifluvial sand and gravel and much thicker accumulations of diamicton interpreted to be supraglacial sediment. Layers of sand and gravel, supraglacial sediment and basal till are stacked-up in this zone (Lundqvist et al., 1993; Johnson et al., 1995). Some of the gravel in the moraine was deposited in subglacial tunnels close to the ice margin (Lundqvist et al., 1993). Erratic boulders are scattered on the moraine and were carried long distances from the Canadian Shield. In moraine exposures, beds of gravel and till are steeply dipping in the up-ice direction, indicating ice push and localized ice-thrusting (Oldale and O'Hara, 1984; Mooers, 1990). moraine surface profiles in grey and tunnel channel bottom with the lower solid line. The dotted lines to the left of each profile show the slope of tunnel channel outwash fans. (From Clayton et al., 1999). Note that the horizontal and vertical scales are different for each figure. as it approached the ice margin (Clayton et al, 1999). Some sediment within the fans is extremely coarse. Intermediate axes of boulders of up to 2 m have been described in the proximal part of the fans, grading into fine sand in the distal part of the fan (Cutler et al., 2002). A considerable volume of sand and gravel, and supraglacial sediment is present in interlobate areas and in the moraines themselves, indicating that there was more sediment on the ice surface than in landsystem A. During the retreat phase there was substantial sediment transport by supraglacial and englacial streams on and within the ice. The landforms in the subglacial zone are strikingly different from those in landsystems A and C. In landsystem B most of the surface has been streamlined by ice flow (Figs 6.12 and 6.13). Figure 6.11 A schematic diagram showing the landforms and sediments in landsystem B. The marginal zone is dominated by high-relief hummocky topography. This zone contains a thick cover of supraglacial sediment, over basal till and sand and gravel. The subglacial zone is dominated by drumlins and flutes. This area contains less supraglacial sediment as a very thin cover sometimes existing as small moraines that were deposited during retreat. Eskers and other ice-contact material were also deposited during retreat. Bedrock in this area is usually covered with glacial sediments, but in many areas the glacial sediment cover is very thin (<5 m). Drumlins and megaflutes up to 50 m high and as long as 30 km occur throughout this zone (Colgan and Mickelson, 1997). Thousands of drumlins occur in eastern Minnesota, in Wisconsin, Michigan, New York and in southern New England. The composition of most of the drumlins is not known. In Wisconsin, New York and Massachusetts, some drumlins are composed of stratified sand and gravel (Upham, 1894; Alden, 1905; Fairchild, 1907; Whittecar and Mickelson, 1977, 1979; Stanford and Mickelson, 1985). Other drumlins are composed of diamicton, some have bedrock cores and some contain lake-sediment (Alden, 1905; Colgan and Mickelson, 1997). In Wisconsin and southern New England at least, the drumlins appear to be composed to a great extent of material that pre-dated the drumlin-forming phase (Whittecar and Mickelson, 1977, 1979; Stanford and Mickelson, 1985; Newman and Mickelson, 1994). Thus, drumlins appear to be partly erosional features, although certainly part of their height and length is attributable to growth beneath the ice from sediment moving toward the axis of the drumlin and deposition of diamicton and down-ice accretion of eroded material (Boulton, 1987). It has been argued (Mooers, 1989b) that drumlins formed at different times during retreat, but the largest fields formed when ice was near its outermost position. Smaller drumlin fields were then superimposed on larger forms as ice retreated and briefly stabilized at other positions (Colgan and Mickelson, 1997). Figure 6.12 A) A shaded-relief image showing the topography of landsystem B in northern Wisconsin. This landsystem was created by the Langlade lobe from about 21,000-16,000 l4C years BP. Note the distinct contact between proglacial glacifluvial deposits and hummocky end moraine. B) A shaded relief image showing the subglacial zone of landsystem B in southeastern Wisconsin created by the Green Bay lobe between 21,000 and 16,000 l4C years BP. Figure 6.13 Oblique aerial photos of landforms in landsystem B. 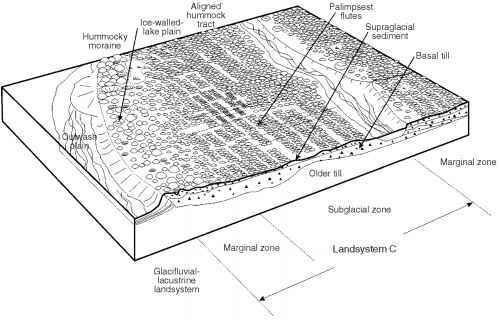 A) High-relief hummocky topography and ice-walled lake plains deposited by the Chippewa lobe in northern Wisconsin. B) Green Bay lobe drumlins of the Madison drumlin field. This photo is of the same region shown in the DEM of Fig. 6.I2B. C) Hummocky topography of the Johnstown moraine deposited by the Green Bay lobe. D) A single drumlin of the Madison drumlin field. (Courtesy of Donna Stetz). percentage of local material. Far-travelled material is more common in supraglacial sediment in the marginal zone. This is different from the far-travelled nature of till in landsystem A and indicates much more local erosion. Striated rock surfaces are present even in the marginal areas, but striated boulder pavements are rare. Many bedrock exposures show indications of plucking and removal of large clasts as well as abrasion. 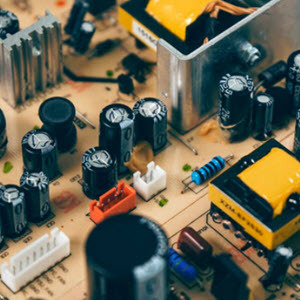 There are other major differences between landsystems B and A. The low-relief till plain of landsystem A is absent. Additionally, numerous small moraines are commonly superimposed on the drumlinized surface (Fig. 6.14). We believe that these are similar in origin to annual moraines formed in Iceland (Boulton, 1986; Krüger, 1994a), but different from the aligned hummocks found in landsystem C (see Colgan, 1996; Clayton and Attig, 1997; Ham and Attig, 2001). Figure 6.14 A) Aerial photograph showing small push moraines deposited by the Green Bay lobe during its retreat (photograph from USDA, WU-3P-26,I955, Dane County, Wisconsin). 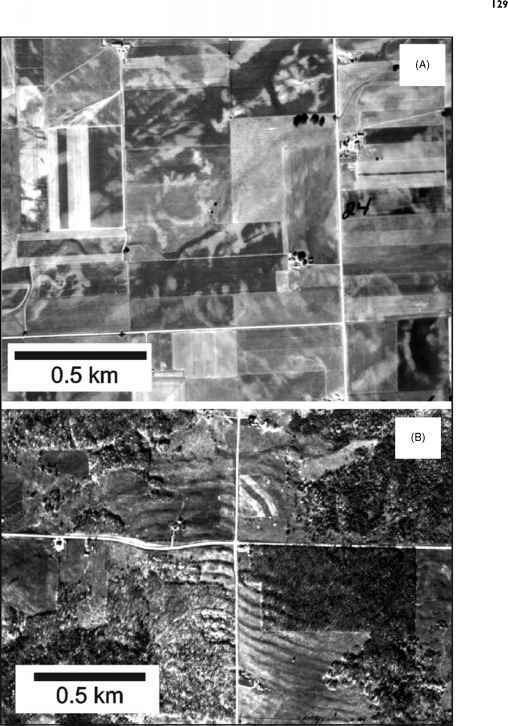 B) Aerial photograph showing small moraines deposited by the Wisconsin Valley lobe in northern Wisconsin (Ham and Attig, 2001). when ice was at its maximum, extensive outwash was being generated along the ice margin as well as from tunnel channels. We interpret the tunnel channels as indicators of large discharges of subglacial water, perhaps stored as an extensive subglacial layer and then released during discrete events (Cutler et al., 2002). Wood is not present in the tills of landsystem B. We believe the absence of wood is an indication that continuous permafrost and tundra conditions existed when ice advanced to its maximum position in the area of landsystem B (Fig. 6.15). Both outside and inside the outermost margin of the ice in landsystem B there are indications of former permafrost. 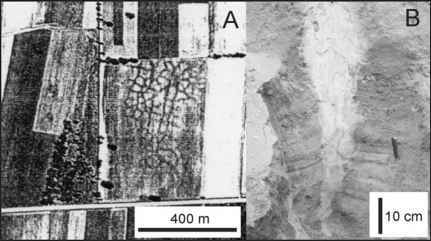 Patterned ground can be observed on aerial photographs (Fig. 6.15), particularly on outwash surfaces created during the last glacial maximum (Black, 1976b; Pewe, 1983; Ham, 1994; Johnson et al., 1995; Colgan, 1996; Clayton and Attig, 1997; Clayton et al, 2001). The abundance of locally derived basal till suggests that material was eroded at the base of the ice and there was relatively little upward movement of basal sediment, except for stacking of debris-rich slabs near the terminus. Incorporation of local material and the prevalence of streamlined forms suggest that erosion was the dominant process occurring behind the terminus. This zone of erosion was time-transgressive and changed in size during advance and retreat because of the interaction of the thermal regime of the lobe and the underlying subglacial permafrost (Cutler et al., 2000). Another indication of the prevalence of subglacial erosion is the rarity of paleosols. 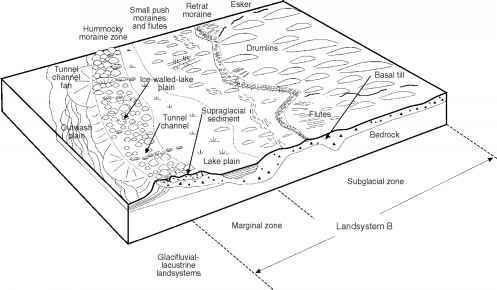 There are a number of buried soils and organic deposits in Michigan associated with landsystem B, but most of these are in buried valleys where they have been protected by a thick cover of glacifluvial or glacilacustrine sediment. Figure 6.15 A) Aerial photograph showing relict ice-wedge polygons developed in outwash (USDA AX-5R-188, 1956, Dodge County, Wisconsin). B) Photograph of ice-wedge casts located in southern Wisconsin. 4. initial advance over a frozen subglacial bed followed by progressively retreating ice during deglaciation. Landsystem C occurs in North and South Dakota, western Minnesota, Iowa and in a small part of eastern Ohio (Fig. 6.6A). We interpret that this landsystem primarily reflects ice-lobe surges and widespread ice stagnation over large areas (Clayton et al., 1985). While it is possible that glacier surges have occurred in areas where landsystems A and B are dominant we do not see evidence for large-scale ice stagnation in zones greater than 20 km wide as we do in landsystem C.
Figure 6.16 Schematic diagram showing landforms and sediments in landsystem C. End moraines are rare and consist of zones of thick supraglacial sediments (>3 m) over basal till. Hummocks are not well aligned in the end-moraine zone or may be superimposed on a broad end moraine. Aligned hummock tracts cover nearly the entire subglacial zone. In a few places, aligned hummocks may be seen to drape over flutes. In the subglacial zone, supraglacial sediments are thinner (<3 m). Older glacial deposits of loess and older tills underlie most of the area and can be quite thick (generally >30 m). 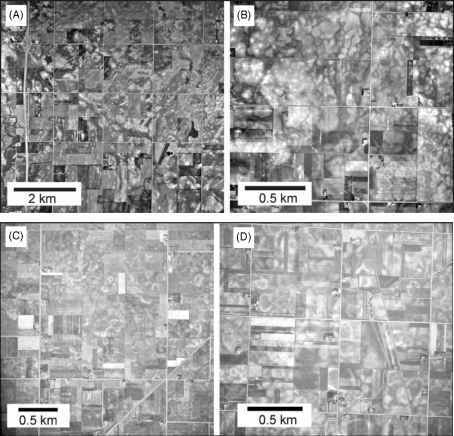 Figure 6.17 A) Oblique aerial photograph of low-relief hummocks in Iowa. (Courtesy of Tim Kemmis). B) DEM of area in southern Minnesota where aligned hummock tracks are superimposed on till plain of basal till. The hummocks are composed of thin supraglacial sediment and basal till. C) A DEM showing rare end-moraine ridges covered by aligned hummock tracts in central Iowa. The curved moraine ridges have been mapped as the Altamont moraine in Iowa. Aerial photographs show that this entire area is covered with aligned hummock tracts. D) Aerial photograph of aligned hummock tracts in central Iowa deposited by the Des Moines lobe. (Courtesy of Tim Kemmis). slopes gently downward on the proximal side. In some areas hummocky end moraines are not present near the terminus and the subglacial zone of aligned hummocks begins at the terminus. Low-relief hummocky topography creates closed depressions that are generally less than 3 m deep (Fig. 6.18). End moraines are generally 2-20 km wide but are less continuous than in landsystem A and B. 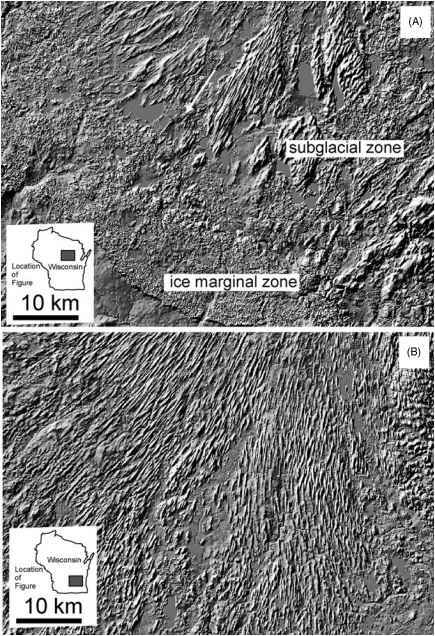 Another landform found in the marginal zone of landsystem C in North Dakota is the ice-thrust mass (Moran et al., 1980; Bluemle and Clayton, 1984; Clayton et al., 1985; Aber et al., 1989). This mass appears as a hill of sediment or bedrock up to 1 km across and a few metres to a few tens of metres high. Generally, the thrust mass is paired with a depression of similar size up-glacier. These masses have moved down-ice with very little internal deformation except faulting and drag folding along faults at the base. These 'hill-hole pairs' generally formed within 1 or 2 km of the terminus. Far more common are larger thrust masses of Cenozoic and Cretaceous shale and sandstone that have been moved up to several km in the down-ice direction at the bed of the glacier (Moran et al., 1980). Figure 6.18 A) Aerial photograph of aligned hummock tracts in Story County, Iowa (NAPP photograph 2122-121, 1990). 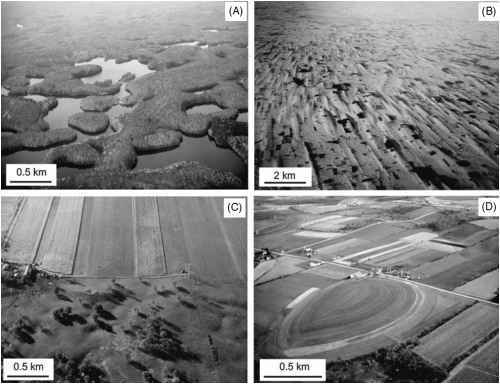 B) Circular aligned hummocks grading into disintegration rings in central Iowa (USDA BZI-2JJ-78, 1968). C) Disintegration rings in central Iowa (USDA photograph BZR-2V-28, 1958). D) Disintegration rings in central Iowa (USDA photo BZF-lJJ-243, 1968). These photographs show that aligned hummocks are transitional features to disintegration rings. Both features are a product of ice stagnation and deposition of supraglacial and englacial debris. A major difference between landsystems C and A occurs behind the moraine. Here instead of flat till plain, the surface in most places has small (1—3 m high) ridges that have been called 'washboard moraines' or 'minor moraines' (Gwynne, 1942, 1951; Elson, 1957; Foster and Palmquist, 1969; Kemmis et al., 1981; Stewart et al., 1988). Colgan (1996) called these features aligned hummocks because they consist of individual hummocks about 10—30 m in diameter, aligned in rows perpendicular to flow (Figs 6.17 and 6.18). We believe that they are not end moraines and did not form at the terminus, but instead formed in a zone of stagnant ice within 40 km of the terminus (Colgan, 1996). These features are transitional to hummocks superimposed on the end moraine of the marginal zone. In many places where no end moraine exists, these features extend to the former terminus of the lobe. The subglacial zone is up to 40 km wide and consists mostly of aligned hummocks oriented perpendicular to the ice margin (Fig. 6.18). They grade into larger hummocks in the marginal zone. Spacing is about 200 m between groups of aligned hummocks. 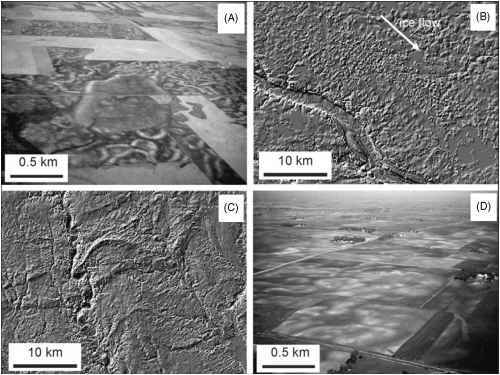 Detailed mapping of these features in central Iowa indicates that areas of aligned hummocks are grouped into coherent tracts up to 10-40 km behind former ice-margin positions (Colgan, 1996). In Iowa there are at least seven such ice-margin positions and associated aligned hummock tracts (Colgan, 1996). These features merge with disintegration doughnuts and other features that clearly suggest widespread ice-stagnation (Parizek, 1969; Clayton and Moran, 1974). Their close association with circular doughnuts and the transitions commonly seen between aligned hummocks and doughnuts suggest that they are genetically related as ice-stagnation features showing various degrees of structural control by stagnant ice features such as crevasses and ice foliation (Fig. 6.18). In at least a few places in Iowa and in North Dakota aligned hummocks are superimposed on megaflutes assigned by us to landsystem B (Bluemle et al., 1993). Basal till is up to 10 m thick in the marginal zone (Kemmis et al., 1981), and Clark (1991) showed that striated clast pavements are also common in this area at the base of till units. Megaflutes underlie aligned hummocks in North Dakota and in parts of northern Minnesota. In North Dakota streamlined landforms are long and narrow, commonly about 0.1 km wide and 1-5 km long. Some are up to 27 km long (Bluemle et al., 1993). Megaflutes appear to be erosional or ice-moulded features. They contain till, sand and gravel, lake clay, shale and other sediments that were at the bed at the time of the last glacial advance. Bluemle et al. (1993) report evidence of squeezing and flow of material into the megaflute form. This is a good example of how one landsystem can be superimposed over another. In this case, landsystem C has been superimposed over landsystem B. Several researchers have examined the origin of aligned hummocks in Iowa. Stewart and others (1988) called them 'corrugated moraines' and suggested they formed by thrusting of basal debris. 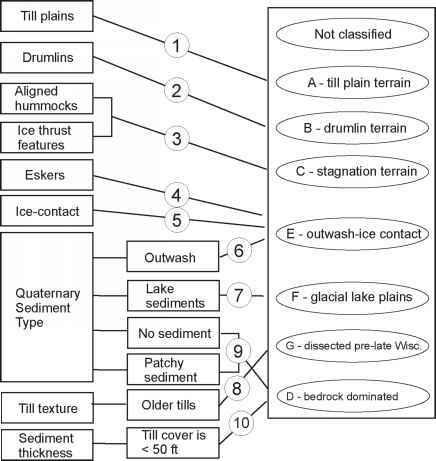 Kemmis (1992) referred to the depressions between hummocks as 'linked depressions' and concluded that doughnut topography and associated aligned hummocks are mostly englacial sediment that accumulated in crevasses or other openings in stagnant ice. Other observations (Stewart et al., 1988; Patterson, 1997b) suggest that aligned hummocks are subglacial in origin with only a drape of supraglacial sediment over them. Similar to this, Colgan (1996) hypothesized that they formed when basal debris-rich ice was extended and then compressed longitudinally within 40 km of the terminus during a surge event. After this, dead ice melted in this broad zone of compressed ice, aligned hummocks formed where concentrated basal debris-rich layers melted out and were then partially reworked as supraglacial sediment into patterns reflecting ice fabric in the zone of compression. In some areas farther up-ice where longitudinal extension of ice occurred some of the aligned hummocks may have directly formed as basal crevasse fills (Colgan, 1996; Patterson, 1997b). The discussion of the origin of these features has been somewhat confused in the past, probably because some of these features formed near the terminus (the aligned hummock tracks) related to compression of stagnant ice, while other features formed far up-ice as basal crevasse fills. The basal crevasse fills described by Patterson (1997b) in southwestern Minnesota are much more ridge-like and linear than are the aligned hummocks in central Iowa (Kemmis et al., 1981; Kemmis, 1992; Colgan, 1996). Clayton, 1984; Evans et al., 1999b). This could be the case, as these extremely long, streamlined features are very different from the drumlins found in landsystem B. It is clear that the megaflutes are palimpsest features and that aligned hummocks, crevasse fills and eskers are superimposed upon them, and this is what would be expected if supraglacial sediment was draping basal till. Megaflutes may have formed during ice streaming to the ice maximum or during surge events that produced ice-thrust masses, and then longitudinally deformed basal debris formed the overlying aligned hummocks as this material melted out. Presumably where supraglacial sediment was thick enough, megaflutes would be completely buried. In both Iowa and North Dakota, streamlined landforms can be seen to underlie a thinner layer of supraglacial sediment in a few places. Ice-thrust features in North Dakota overlie sand and gravel aquifers in buried valleys. It has been suggested (Moran et al., 1980; Bluemle and Clayton, 1984) that ice-thrust masses occur because of steep groundwater gradients in the terminal zone caused by the blocking of subglacial drainage by subglacial permafrost at the ice margin. They may also be associated with surges and share a common genesis with similar features in Iceland (Evans et al., 1999b). Although basal till is common it appears that more supraglacial sediment is present in landsystem C than in either landsystem A or B (Clayton et al., 1985). The aligned hummocks and basal crevasse fills are composed primarily of basal till in their lower parts with varying amounts of supraglacial sediment deposited on them during wastage of stagnant ice (Kemmis et al., 1981; Kemmis, 1992; Colgan, 1996). We believe that the superposition of landsystem C over megaflutes in this zone suggests that glacier surges or fast flow dominated post-LGM readvances in this part of the ice-sheet margin (Clayton et al., 1985). The timing of the maximum ice extent in this region (at 14,000 14C years BP) was out of phase with the rest of the southern LIS margin. 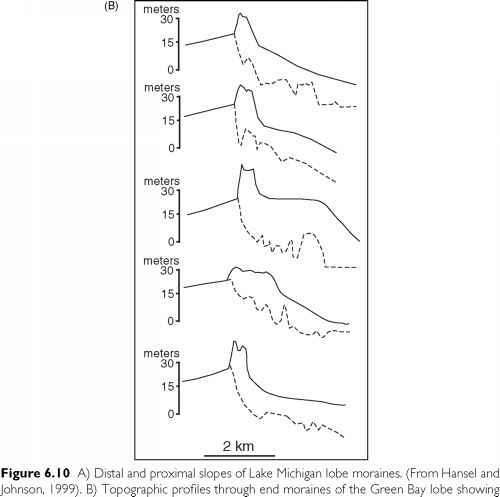 This suggests that these lobes were advancing when more basal water was available during warmer post-LGM climatic conditions (Kemmis et al., 1981; Clayton et al., 1985). Megaflutes and boulder pavements could have formed during rapid basal sliding during the surge event or as fast steady flow fed by an ice stream up-ice (Patterson, 1998). Ice and basal debris were longitudinally compressed near the terminus perhaps during the propagation of a surge wave through the glacier. Ice thrusting of proglacial and marginal material and compression of basal debris-rich ice resulted in the formation of ice thrust masses, aligned hummocks and widespread ice disintegration features (Colgan, 1996). 3. ice motion dominated by unsteady surge-type or fast ice flow followed by stagnation of ice over a broad area behind the terminus. This landsystem is common in New England, New York, Pennsylvania and New Jersey. It consists of high-relief bedrock terrain draped by till, with glacifluvial and glacilacustrine sequences filling most valleys. We make the interpretation that most of this region reflects glacial erosion of a pre-existing high-relief bedrock terrain during advance to the last glacial maximum. 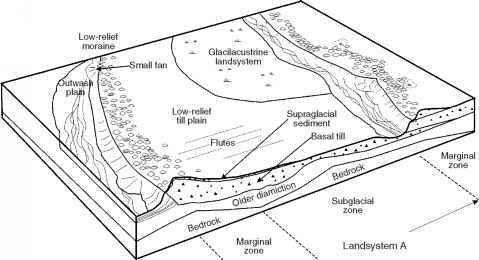 Ice-contact and glacifluvial (landsystem E), and glacilacustrine/glacimarine deposition (landsystem F) dominated as a progressively retreating terminus developed local ice-stagnation zones near the margin. After about 13,000 14C years BP, ice probably become regionally stagnant in northern New Hampshire and Maine as it became isolated from the main body of the dwindling LIS. Features such as cols, ice-marginal channels, eskers and other ice-contact deposits suggest that as the ice wasted, high peaks were exposed as nunataks followed by isolation of ice in major valleys (Goldthwait and Mickelson, 1982). Detailed mapping of striations also suggests that ice flow reversed direction in northern Maine as ice was drawn down in the St Lawrence lowland (Lowell et al., 1986). Besides the well-formed and mapped end-moraine systems in southern New England that we have classified as landsystem B or E (Oldale and O'Hara, 1984), large end moraines are relatively rare in New England (Koteff and Pessl, 1981). Very small moraines in Connecticut, Maine and Massachusetts are present, but these features are most similar to the small push moraines present in the Great Lakes region (Stone and Peper, 1982; Goldsmith, 1987). Small recessional moraines in Maine occur in association with glacimarine deposits and may be similar in origin to DeGeer moraines (Kaplan, 1999). Most of this area where these moraines occur has been classified as landsystem B or F.
The dominance of glacifluvial deposition in bedrock valleys during deglaciation has been described in detail by Koteff and Pessl (1981), Mulholland (1982), and Stone and Peper (1982). Outwash sequences called 'morphosequences' (Koteff and Pessl, 1981) were created by a progressively retreating ice margin that stagnated near the terminus in zones 2—5 km wide (Mulholland, 1982). Each morphosequence includes glacifluvial and glacilacustrine deposits that are graded to an ice margin position and a local base level established briefly during a progressive retreat. A zone of stagnant ice several km wide formed as ice retreated over highrelief bedrock surfaces. In this zone ice-contact sand and gravel were deposited. Temporary lakes also formed in this bedrock-controlled landscape, and many of the valley sequences include deltaic and varved sediment (Ashley, 1975). Bedrock ridges oriented parallel to the ice margin were particularly effective at detaching zones of stagnant ice from active ice as the margin retreated northward over the terrain.